Author and retired political science profesor Jim Clarke comes here every Monday and Thursday and washes the soup pots! A week ago he and his daughter Julie Brogna, also a Casa Maria supporter, went to see the UA Wildacts come back from a nine point deficit with 1:30 left in the game to defeat the mighty Cal Bears, thanks to 3 incredible 3 pointers by Gabe York. After the game Jim and Julie went to Old Chicago for a beer and who should enter but Gabe York! He received a big ovation and then he went and greeted everyone there. He even posed for this picture with Julie! May Gabe continue to shoot like Stephen Curry and Salim Stoutamire in the NCAA tourney which starts Thursday. Jim Clarke es un autor y profesor retirado. El viene aquí a Casa Maria cada lunes y jueves a limpiar las ollas! Una semana atrás, el y su hija, Julie Brogna, fueron al juego de basketball entre los Wildcats y los Osos de Califas. Los Wildcats ganaron. 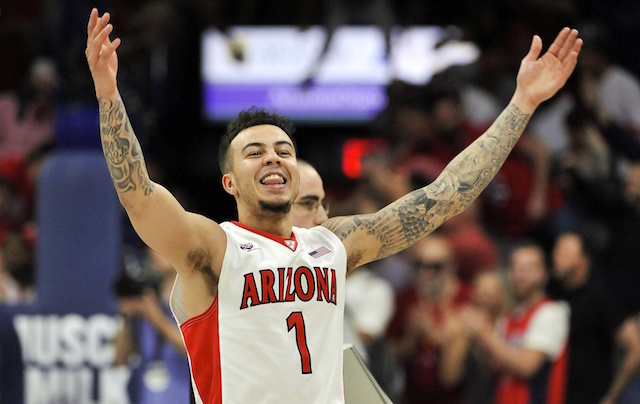 El juego fue muy emocionado e importante y el héroe fue Gabe York. Después del juego, Jim y Julie fueron a Old Chicago para unas cervezas. Gabe York entro a la cantina y la gente lo recibió con aplausos, el saludo a todos ahí y poso para una foto con Julie! Espero que el tire la pelota como Stephen Curry y Salim Stoutamire en el torneo NCAA que empieza este jueves. ← THE HOLY FATHER WOULD AGREE WITH BUS RIDERS UNION ON A DEDICATED FUNDING SOURCE FOR TRANSIT!